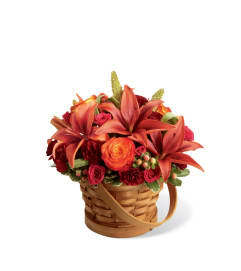 The FTD® Bountiful™ Bouquet is blooming with harvest cheer and undeniable beauty to send your special recipient a gift exuding warm harvest wishes with each gorgeous bloom. Eye-catching orange roses are arranged amongst burgundy mini carnations, butterscotch daisies, rust colored Asiatic lilies and lush greens to create an exquisite autumn inspired flower bouquet. 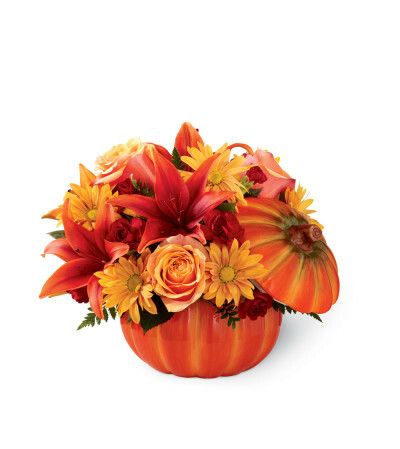 Our exclusive pumpkin container arrives with a lid to be a cherished keepsake long after the initial offering of flowers has faded to make this mixed flower bouquet a wonderful Thanksgiving, Halloween, birthday or thank you gift.